Printed copies of the 2018-2019 concert brochure were distributed in August 2018 to all those on our mailing list. Not on the list? To request your own copy, email musicevents@uwo.ca with your mailing address. If you were expecting a copy and it hasn't arrived by early September, please email us to follow up with your new mailing address. Feel free to stop by Talbot College room 232 to pick up a copy in person after August 28. Sign up for our monthly email to receive a "sneak peek" electronically in mid-August (sent on August 17, 2018) and to be notified year-round of any schedule changes after the printed brochure is finalized in August. Schedule changes will also be posted on this webpage (below). Planning is well underway and we look forward to sharing another year of music with you! Ensure we have your current mailing address to receive a copy of the printed brochure, and sign up for the email to get year-round updates and the pre-season "sneak peek". Events Calendar houses ALL upcoming events, including 150+ student recitals each year. The events calendar has the most comprehensive and up-to-date information. 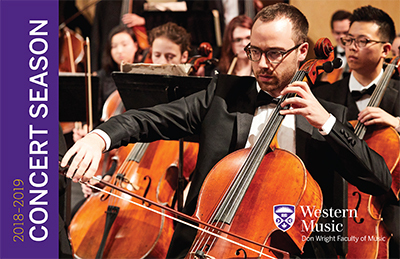 Call 519-661-3767 or email musicevents@uwo.ca for more information on upcoming events. > Masterclass: Jean-Guy Boisvert (clarinet) - revised date - September 12 (originally scheduled for Sept. 13). Visit the Events Calendar for detailed time and location information. > Guest artist concert Michael Ouzounian, viola, with Ensemble 1919 originally scheduled for November 3 has been cancelled. Viola masterclass will take place on Friday, November 2 in Studio 242 from 2-5 p.m.
> Wind Ensemble - Thursday, February 14, 2019 - is the correct day of the week (printed brochure p. 8 mistakenly notes Tuesday). Concert date is unchanged and remains on February 14. > Fridays @ 12:30 Concert Series - Friday, March 8, 2019 - New program*: Pleasures: Love and Food! DMA candidate Jennifer Cyr, soprano, with Samantha Lee, piano, and Catherine Fraser, clarinet, perform contemporary works about love and food. Works by Heggie, Tiefenbach and Uyeda. *The Nicole Lizée, Eve Egoyan concert originally scheduled will be presented at a later date. > Music of our time: MMus Composition Premieres - Tuesday, March 26 - CANCELLED - this event has been cancelled and will not be rescheduled.